Picture taken from state Pakistan Television shows the Pakistan nuclear blast site in Chagai district of Balochistan province at the moment of detonation. May 28 is officially a “Day of Greatness” for Pakistan, but for many Balochs it’s a black day. The locals still suffer as a result of the nuclear explosions the Pakistani government set off in the Ras Koh mountains 19 years ago. The new generation of Baloch inhabitants in the region is plagued with serious diseases stemming from those blasts. 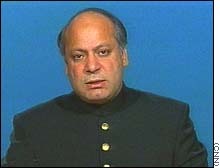 And all in Balochistan are constantly reminded of the promises made at the time by Prime Minister Nawaz Sharif (then serving his second of what would be three terms, spread out over 17 years) to invest in health, education, roads, and infrastructure in the province — promises that have yet to be fulfilled. This month we learned the U.S. Marines are back in Helmand, Afghanistan’s most violent province and the center of opium poppy production, and their mission may expand. President Trump will soon decide if he should send 8,400 more troops there for the latest chapter in America’s longest war. Should he? I think not. We gave Afghanistan out best effort: over 2,200 dead soldiers, over 20,000 wounded, and over $700 billion for everything from ammunition to medical care for veterans. We need to face the fact that it’s an endemically violent place and may never change and another “whole of government” effort may not make any difference. And don’t take my word for it: the Talban has rejected peace talks with the Afghan government as surrendering to the enemy and against Islam. The Afghans have seen off every visitor and invader, from Alexander the Great to the U.S. Central Command, so why spend another dollar there? For example, the regional transport network has avoided Afghanistan and the enthusiasts for a New Silk Road or One Belt, One Road haven’t absorbed that the world is avoiding Afghanistan not out of stupidity but out of hard-won experience. Summary: Monday’s post looked at how China’s Belt and Roads Initiative was spurring growth in the less developed areas of Asia and Africa — and linking those nations more tightly to China. 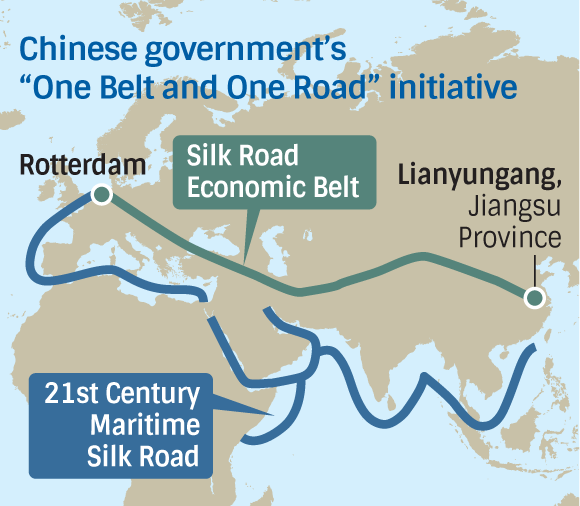 Here Stratfor looks at how the B&R initiative links to Europe, the end of its new Silk Road. China uses the EU’s weakness as an opportunity to deepen its relationship with Eastern Europe. If only America had leadership even half as wise! But we have our self-esteem, secure in the knowledge of our exceptionalism. China’s Belt and Road Initiative encompasses six economic corridors. But in geographic and ideological terms, Europe represents the end of the new Silk Road. Increased connectivity with Europe could offer China a chance to expand its access to new markets, as well as to high-tech and strategic assets, thereby facilitating its domestic industrial reform plans. Despite Beijing’s stated goal of fostering greater integration throughout Eurasia with its Belt and Road scheme, however, its approach on the Continent has so far emphasized bilateral or subregional agreements with states in Central and Eastern Europe, as well as the Mediterranean. The strategy has raised concerns among the European Union’s central powers that Beijing’s influence in the countries could threaten their own, particularly as the bloc’s political and economic rifts widen. Like many markets in India, the four-wheeler market has just far too many players and other companies may follow in GM in its exit from the country. However, that should not distract the government from enacting market friendly reforms which are needed anyway. Even as India has remained the world’s top foreign direct investment (FDI) destination for two years running, topping China and the US, a small trend of disinvestment and near exits are also worth noting. Last week, General Motors announced its decision to exit India, after failing to set the automobile buyers’ heart aflutter for over two decades. A few months ago, Vodafone effectively said it is facing investment fatigue in India, and agreed to merge with Idea Cellular, and even giving Kumar Birla a chance to equal his stake in the combined entity. And three years ago, Nokia wound up shop in Chennai and fled to Vietnam, where the tax regime is less taxing. In part, the Nokia exit was the result of a dramatic shift in demand for mobile phones from feature to smart. It went too downmarket to survive when demand patterns changed. The Vodafone fatigue relates to low returns in a price sensitive market that had spectrum costs going through the roofs, thanks to the shift from arbitrary allotments of low-priced spectrum to auction-determined ones. It is also the victim of tax terrorism, having been forced to face the taxman despite a Supreme Court verdict in its favour. The China-Pakistan Economic Corridor (CPEC) is a multi-billion-dollar strategic project that connects the Maritime Silk Road and the Silk Road Economic Belt, also known as “One Belt, One Road” (OBOR). It is an ambitious geostrategic plan to carve out a combination of continental and maritime influence. The aim of the project is to link northwest China with ports in the Arabian Sea via a road and rail corridor. It provides China the shortest and quickest access to the Arabian Sea and the Persian Gulf. Through CPEC, which includes Gwadar Port in the restive Balochistan province of Pakistan and construction in disputed Kashmir, China will project its power in the Indian Ocean Region. Artificial islands created by China in the South China sea and ports such as Hambantota, Karachi, Gwadar, and even Djibouti need to be viewed as part of one continuum. Bangladesh’s population of 160 million is as big as France, Germany, and the Netherlands combined. The country is also easily the poorest of the world’s 10 most populous. Given its size and the depth of its poverty, the country’s recent economic boom must rank as one of the world’s happiest economic stories right now. Bangladesh’s rapid growth wouldn’t be so exciting if it didn’t reach the poor. A recent World Bank report (pdf) found that between 2005 and 2010, average incomes for the poorest 40% of households grew 0.5% faster than for the country as a whole. By comparison, in India the poorest 40% of households did worse than the national average over a similar period. As a result of this inclusive growth, poverty rates have plummeted. In 1991, well over 40% of the population lived in extreme poverty. Today, the World Bank says that less than 14% still does. That is, about 50 million fewer Bangladeshis are in extreme poverty as a result of the improving economy. Under Xi Jinping, China has intensified its focus on “seizing discursive power” (话语权) and “propagating China’s voice” at the global level. Indeed, the recent One Belt, One Road summit in Beijing has highlighted China’s ambitions to exert its influence upon the international order—and adjust it to its own advantage. For China, this concept of discursive power is often considered a critical aspect of its comprehensive national power. Indeed, to the Chinese Communist Party (CCP) and its People’s Liberation Army (PLA), information is a weapon. The CCP has pursued Internet control through an extensive, adaptive system in order to avert threats to social stability and its survival, while seeking to assert its influence through shaping public opinion with domestic and external propaganda. Concurrently, to operationalize discursive power, the CCP and PLA have built upon an extensive history of political warfare to engage in concerted influence operations, with Taiwan as the primary target but also against the U.S. and worldwide. 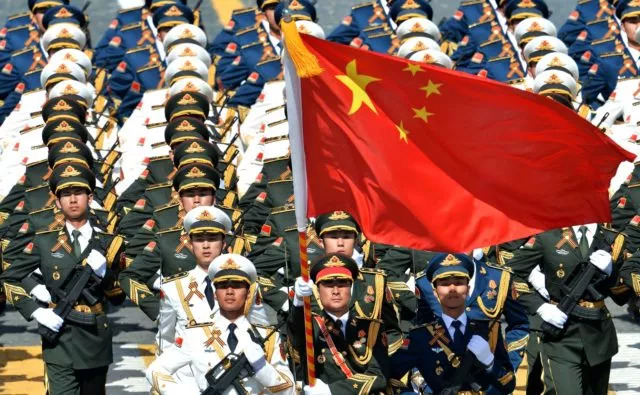 These dimensions of Chinese discursive power—Internet control, propaganda work and political warfare—enable the CCP’s defense of China’s core sovereignty, security and development interests, while advancing national strategic objectives. JAKARTA, Indonesia — This month, Jakarta’s embattled former governor, Basuki “Ahok” Tjahaja Purnama, was sentenced to two years in prison for blasphemy against Islam, based on his flip quotation of a Quran verse that addresses whether Muslims can elect non-Muslim leaders. The presiding judge declared that Ahok did not express enough remorse for his indiscretion. Many of us these days find ourselves channeling our inner Miss Clavel. Defense Secretary Jim Mattis, for one. In Dexter Filkins’s profile of Mattis for the New Yorker, the most striking moment comes when Mattis is asked what worries him most in his new role. Filkins expected to hear about the Islamic State, or Russia, or the defense budget. Something is not right. If anything, Mattis’s diagnosis seems understated. This national distemper, the sour, angry mood infecting the body politic, was evident before Montana congressional candidate Greg Gianforte body-slammed a reporter for daring to ask a question; then had his campaign lie about it; then failed to apologize — until after he won the election. It was evident before Gianforte’s current allies and future colleagues were muted, to put it mildly, in the face of his audio-taped assault. “We all make mistakes,” said Rep. Steve Stivers (R-Ohio), who chairs the House Republicans’ campaign arm. This was not a mistake; it was an assault on a reporter doing his constitutionally protected job. The Army wants an upgrade from the M16. Several companies have key products that may result in a contract. May be too early to make any bets, but watch for developments. An initiative to find a better rifle and/or accompanying munitions has been resurrected by the US Army. There was a battery of tests conducted from 2011 to 2013 to find an improved weapon system whose performance out-scaled the M16/M4 but the initiative was abandoned because none of the tested replacement rifles/ammunition showed significant enough of an improvement above that current platform. Another study was started in 2014 and will wrap up in the next couple months that researched further the direction the army should go with their small arms capabilities. Today I will discuss what implications this renewed hunt may have for publicly traded firearm-defense-munitions companies that could be contracted to research, develop, design, and manufacture the new weapon/ammunition, or which companies might be contracted because they already manufacture what the military is looking for. Any contract would potentially be worth hundreds of millions of dollars and could send the lucky stock soaring. Timelines stated by army personnel site 2020 as the hopeful date to have a working prototype. Summary: Today Martin van Creveld looks at one of the most exceptional aspects of US defense policy, our weapons. A naïf would describe it as quite mad, unaware of the lavish salaries and great corporate fortunes created by tapping the almost limitless flow of taxes from the apathetic and credulous citizens of America. “In the year 2054, the entire defense budget will purchase just one aircraft. This aircraft will have to be shared by the Air Force and Navy 3-1/2 days each per week except for leap year, when it will be made available to the Marines for the extra day. At least since 9/11, and possibly since the First Gulf War back in 1991, it has been clear that the most immediate threat facing developed countries is not other developed countries. It is terrorism, guerrilla, insurgencies, asymmetric war, fourth generation war, war among the people, nontrinitarian war (my own favorite term), whatever. Follows a list — a very partial one, to be sure — of expensive new American weapons and weapon systems, now in various stages of development, all of which have this in common that they are not relevant to the threat in question. The first month of 2012 was, indeed, a highly auspicious time to wave the banner of special-operations forces in support of a new national-security strategy. Through the Osama bin Laden raid and other recent victories, special operators had amassed unprecedented prestige both within Washington and in the country more generally. Special-operations forces seemed not only more exciting, but also more efficient and decisive than the conventional military forces that had been employed in the wars of Iraq and Afghanistan. Hollywood was releasing movie after movie extolling the virtues of the special units, including a film called Act of Valor that starred active-duty SEALs. Earlier this month, the campaign of French presidential election candidate Emanuel Macron fell victim to targeted cyber intrusion efforts by infamous Russian hacking collective that goes by a number of names including Pawn Storm, Strontium, Fancy Bear or APT28. Spear phishing email attacks against Macron’s En Marche! Party were followed by the public release of 9 gigabytes of reportedly confidential communications less than 48 hours before ballot boxes opened. While Macron was still able to secure the presidency on 7 May, his campaign said that the efforts had ‘put the vital interests of democracy in jeopardy’. The French experience is just the most recent development in what appears to be a tide change in international cyber relations. The 2016 US presidential race between Hillary Clinton and Donald Trump was a wakeup call that highlighted democracy’s vulnerability to manipulation in today’s digital world. The hacking of multiple state voter registration databases, the strategic dumping of stolen email communications and the prominent position of social media all played a role in undermining public confidence and shaping public opinion. 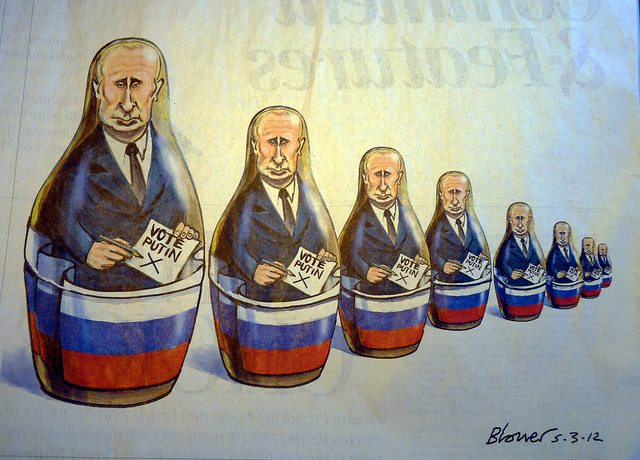 A US intelligence community assessment controversially asserted that, ‘Russian President Vladimir Putin ordered an influence campaign in 2016 aimed at the US presidential election.’ Unsurprisingly, Putin has denied any involvement, but it seems the threat’s here to stay—countries such as Germany and the UK now concerned for the digital security of their upcoming elections. Recently the opening keynote at Google I/O offered us a rare glimpse at some numbers behind the company's vast online offerings. Among other things, CEO Sundar Pichai revealed that more than two billion Android devices are actively used around the world and that six of Google's services have reached over 1 billion users. The numbers, summed up in the chart below, along with recent product/service introductions (e.g. Google Home or Google Lens) illustrate the company’s ongoing efforts to move beyond search. As web usage continues to shift away from PCs and mobile browsers to apps and even voice-activated devices, people may not rely on Google search as much as they used to going forward. Considering that search advertising is still the company’s main source of revenue, it would be careless for Google not to cover all bases. This chart sums up key figures about Google's online offerings. Noted cyber security researcher, guru, and author, Bruce Schneier posted an article on the May 23, 2017 edition of the online defense and national security website…DefenseOne.com, providing his thoughts about who the secretive ‘Shadow Brokers’ group behind the publishing and online selling of stolen NSA hacking tools. Summary: The breakout year for cybersecurity continues, with a massive global attack — more than 45,000 attacks in 99 countries by software linked to (built by?) the NSA (source). In this from the archives cybersecurity expert Marcus Ranum explains defense in this new world. Offense gets all the attention, but smart organisations win by defense. See today’s second post: Skip the hysteria. What you need to know about the big ransomware attack. In the previous chapters of this series, I showed how cybercrime increases our awareness of computer security weaknesses and force us to constantly improve our defenses — accidentally improving our posture against cyberwar and increasing the likelihood that cyberspies will be uncovered. The logistical problems of keeping a cyberweapon fresh and secret are severe, when you consider that you’re fielding it at the targets’ systems — where it is susceptible to dissection and analysis when it’s discovered. This dynamic has already been seen to be at play with the Stuxnet family of attack tools: security responses rapidly co-evolve with attack tools. The Shadow Brokers suddenly appeared last August, when they published a series of hacking tools and computer exploits—vulnerabilities in common software—from the NSA. The material was from autumn 2013, and seems to have been collected from an external NSA staging server, a machine that is owned, leased, or otherwise controlled by the U.S., but with no connection to the agency. NSA hackers find obscure corners of the internet to hide the tools they need as they go about their work, and it seems the Shadow Brokers successfully hacked one of those caches.